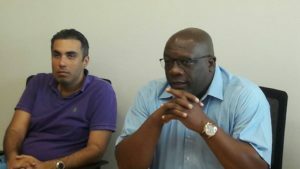 BASSETERRE, St. Kitts, July 31, 2017 (Press Unit in the Office of the Prime Minister) – With employment figures in St. Kitts and Nevis already at an all time high under the watch of the Team Unity Administration, close to three hundred Kittitians and Nevisians are now preparing to take up permanent jobs at Park Hyatt St. Kitts Christophe Harbour, which is set to open its doors and welcome its first guests on November 1, 2017. 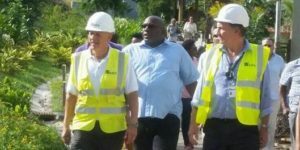 This was confirmed by the Vice Chairman of Range Developments, Mr. Mohammed Asaria, on Saturday, July 29, when the developers hosted St. Kitts and Nevis’ Prime Minister Dr. the Honourable Timothy Harris and a delegation consisting of Cabinet members and other high level officials on a tour of the facility. Speaking afterwards, Mr. Asaria stated that Park Hyatt St. Kitts has already had a positive impact on the federation’s economy through the creation of close to one thousand jobs during the construction phase. “Today (July 29), you would have seen 530 people here this morning. Peak labour was close to one thousand. Permanent jobs, I think 288 job offers have been made to Kittitians and Nevisians, maybe there’s another seven percent of foreign nationals on top of that [who] would be employed by the hotel, so 93 percent local employment once the hotel opens; that’s a pretty impressive number,” Mr. Asaria said. Asaria further stressed that a great deal of effort was made to ensure that priority was given to the local workforce. “There’s been a lot of interaction with CFBC, the Hospitality College. The Food and Beverage Director was there for two weeks training everyday to find the right students, and out of the graduating class, if I’m not mistaken, he recruited up to 80 percent this year and we look forward to that interaction continuing year on year to ensure that this becomes the place to work,” he added. While the majority of the permanent employment positions have already been filled, General Manager of Park Hyatt St. Kitts, Mr. Julian Moore, noted that new opportunities are expected to open up in the near future. “We’re going to be looking at around 288 employees to begin and that’s our full time employees, then on top of that obviously as we get event personnel we’ll be looking at some more casual stuff, some additional part time stuff, and the great thing is with the process that we went through we’ve met so many people, we’ve actually found that we do have some reserve people. So we’ve got people who unfortunately we did not have enough full time positions for but we also see them for potential full time positions because as our occupancy builds over the coming months, we’re going to find that we’re going to need more manning on an ongoing basis, particularly in the build up to high season next year. “So really what we are looking at doing is we’re looking at keeping those resources, staying in touch, letting people know where we’re at and as opportunities come up as long as people are linked in and connected with us then we can keep on having opportunities within the community,” Mr. Moore disclosed. Figures from the St. Christopher and Nevis Social Security Board show that national employment stood at a record high of 24,539 jobs in 2016, up from 24,308 in the previous year. Great for the local economy.